This photo was taken shortly after a young otter, nicknamed 'Olive,' was found on the beach covered in crude oil. The young sea otter was found washed up on the beach in late February, her thick, insulating fur covered with tar balls and slick oil. She had had an encounter with crude oil--likely a natural seep--somewhere off the Monterey coast. Without help, she could die. Instantly, volunteers with the Marine Mammal Physiology Project (MMPP) at UCSC's Long Marine Laboratory sprang into action and were ready when the otter arrived from the Monterey Bay Aquarium, where she had been stabilized. Terrie Williams, professor of biology and director of the MMPP, and her two paid staff members--Traci Kendall and Beau Richter--were gone on research trips when the otter was found, leaving the volunteers to devise a rehabilitation plan for the distressed animal mostly on their own. But Monika Rohrer, 26, a UCSC alumna and one of the lead volunteers in Olive's recovery, didn't panic. "I thought, 'OK, I need to get this in order,'" said Rohrer (biology, '04). Rohrer has volunteered 20 hours a week with Williams's project since 2005; she also works part-time as an aviculturist at the Monterey Bay Aquarium. When otters get oiled, their the fur becomes saturated with water. "It's like a tear in a wetsuit--water infiltrates the fur," said Williams, who directed the Valdez Sea Otter Rescue Center during the 1989 Exxon Valdez oil spill cleanup. "They don't have blubber. Without the protection of their fur, they'll go hypothermic." The otter, who is about a year old, was cleaned with detergent and olive oil--hence her nickname, Olive--and placed in a small pool to allow her saturated fur time to return to normal water repellency, a process that took weeks. There are usually 15-25 volunteers at the MMPP; at the moment, there are 15, said Kendall. They're the lifeblood of the operation, she said. "Our program absolutely would not run without volunteers." Rohrer, fellow UCSC alumna Christina Doll (marine biology, minor in education, '06), and other volunteers provided 24-hour care for Olive for the first four days. They slept in a loft at the Department of Fish and Game's Marine Wildlife Veterinary Care and Research Center, near Long Marine Lab, where Olive is being kept alongside other, permanently housed sea otters. 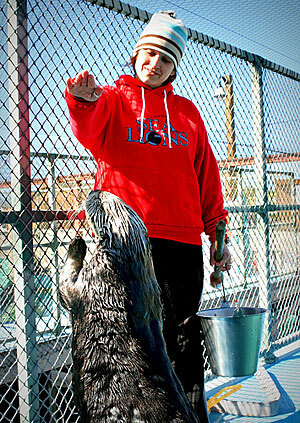 The otters who live at the Fish and Game facility were once stranded and released, but unsuccessful in the wild. Now, they participate in research projects such as measuring how much energy sea otters--considered a threatened species--use to dive and catch food. Olive's first few days were touch and go. "I think I slept two hours the first night, and maybe three hours the next few nights," said Rohrer. Olive required hourly seafood feedings to stoke the internal metabolic fires that keep her body warm. Hour after hour, in the dark, through rain storms, morning frosts, and bone-chilling coastal winds, Rohrer, Doll, and student volunteers from Williams's marine lab thawed and chopped seafood to feed Olive. They constantly monitored her recovery, counting every calorie she ate, celebrating every ounce of body weight she added. "I knew they had the capability to do it--it was just a question of if they had the time, with their other commitments," Kendall said of the volunteers. "They made the time." Many of the project's volunteers are UCSC students, and they give their time to constructive work with animals for years, said Williams. "There's a level of dedication that is rare," she said. "It's astounding given everyone is trying to find jobs and survive, living in high-priced Santa Cruz. But these kids come in there without question and without fail--they recognize that without them, these animals can't eat." In a case such as Olive's, "you've got an animal in an emergency situation, and they responded like paramedics," Williams said. "There was no question about what they were going to do. You can't help but be proud." 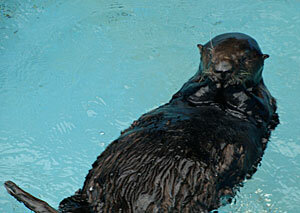 The first week of Olive's stay, volunteers put 348 hours of work into her rehabilitation. For the past three weeks, volunteers have given about 60 hours a week to her recovery. Olive is now ready to be released, pending good conditions. "She should do very well," said Kendall. "Her coat is back to normal, and we've been feeding her live food items, so she shouldn't have forgotten how to forage. I'm guardedly optimistic." For Rohrer, it will be an amazing moment to see Olive return to her ocean home after the effort she put into nursing her back to health. "It was pretty chaotic, but it was amazing," said Rohrer. "It was the best experience. I would never trade it." For updates on Olive and messages from her many fans, check out her Facebook page.